In 2012 the next polar reversal will take place on earth. This means that the North Pole will be changed into the South Pole. Scientifically this can only be explained by the fact that the earth will start rotating in the opposite direction, together with a huge disaster of unknown proportions. In my books I reveal the immense cataclysm that is going to torment the earth in the near future. It is presently assumed by most people and the general scientific world at large, that the rotation of the Earth is stable, however, as expounded in my previous works on this subject, this is not the case. The gruesome reports of the previous catastrophes should, hopefully, be clear to all. The historical exploration of cosmology in previous books is founded on the translation of hieroglyphs, cracking of codes, unveiling of the magnetic reversal of the sun, study of old maps, decoding of astronomical clues, geological research, and the discovery of the most exciting archaeological find in modern times. 1. With clock-like regularity, sudden reversals and pole shifts are natural to the Earth. The result is worldwide destruction, and is supported by paleo-magnetic evidence and early manuscripts. 2. The reversal of the poles is attributed to the harmonic cycle of the magnetic fields of the sun. 3. Polar reversals can be calculated precisely on the basis of the sunspot cycle theory or the magnetic field theory, which the Maya and the Old Egyptians were privy to. These secrets are contained in the Labyrinth of Hawara, a huge complex consisting of three thousand rooms. I explained abundantly clearly that life after a polar reversal is nothing but horror, pure unimaginable horror. All securities you presently have at hand, like – amongst others – food, transport, and medicines, will have disappeared in one big blow, dissolved into nothingness. As will our complete civilization. It cannot be more horrifying than this; worse than the worst nightmare. More destructive than a nuclear war in which the entire global arsenal of nuclear weapons has been deployed in one blow. Are you grasping the facts? The earth will be subjected to total destruction. It will be many times worse than my description. Terrible hunger, cold and pain, and more will rule your daily life: without hope of a quick recovery, because all knowledge and resources will have been completely destroyed. That will be the reality of your daily life after the forthcoming polar reversal. And it is in this scenario you will have to try to survive. At present scientists still do not know much about the mechanism that generates the magnetic field of the earth, which is more than frightening. Without doubt, our continued existence depends upon this. Thousands of years ago our ancestors knew that when this magnetic field tilts, a worldwide destruction takes place. The present geologists, astronomers and physicists know little about this. For that reason we are running towards our end, without a single acknowledgement from official sources. So, what do our professors indeed know? Next to nothing. In short, the scenario is as follows: a solid central core rotates in the center of the earth. It is surrounded by a liquid iron-like layer, on top of which the earth’s crust is continuously drifting. This whole structure therefore appears to be a huge rotating dynamo. In addition, the liquid layer rotates in the electrostatic field of the sun, recharging itself. However, this is not at all efficient: more electrical potential is lost than gained. Just like a battery that is almost empty, it is difficult to recharge and it becomes exhausted more easily and quickly. This is the situation with the “battery” of the magnetic field of the earth. For this reason one sees the force of the magnetic field diminishing, almost 60% over the last two thousand years. At this rate there will not be much left within a couple of decades! And then one can expect a reversal of the poles. But nobody knows in what way this will happen, nor what the consequences will be, in contrast to the Maya and the Old Egyptians who knew the terrible consequences only too well. Their science, their religion and way of life were completely based on them. They encoded their knowledge in Holy Numbers and in their architecture. I needed days, weeks, months and years to follow their carefully applied clues and decode them. After an exasperatingly long search, I found out that these codes were connected with the catastrophic events on earth that were caused by pole shifts. Some of the codes were terribly complicated, although not incomprehensible. Once you have figured out the cipher, you are able to decipher the different levels of their scientific language. Then you can literally peel away layer after layer until you reach the ultimate result: the naked scientific figures regarding the background of these catastrophes. The answers to these questions are alarming and devastating. All my deciphering points to a complex and ingenious science. Let me explain. When you, as a scientist, stumble upon results that the present astronomers do not know, you have, without doubt, stumbled upon something terribly important. Everybody will have to admit it, and that is exactly what I have done: I discovered an echo of a long-lost technological terminology; a majestic building with immensely sophisticated keys. Many numbers were based on the sunspot cycle, which they had discovered. A theory that is irrefutably correct and not known by our physicists! It cannot be more alarming! This theory, in turn, correlates with the periodical polar reversals of the earth. I succeeded in cracking the whole puzzle and a large-scale structure appeared. Its development was such that the mathematical matrix ends on the day of the next polar reversal! Just like the way we count down to the launching of a rocket, they counted down to the End of Times. On the last day of the calendar the magnetic north of the earth will change into the south. They knew this would not only mean the end of their civilization, but also of the whole civilized world! From legends and the sunspot cycle theory of the Maya, we can reconstruct the cause of a polar reversal. It has long been known that when a beam of lightning strikes a magnet, a reversal of the magnetic poles takes place. Let’s apply this principle on a broader scale. Our earth is a huge magnet, with its own North and South Poles. A short-circuit with another external “beam of lightning,” or magnet, can end in a catastrophic polar reversal. This means that the magnetic North Pole changes place with the magnetic South Pole. But what sort of external beam can cause this? What force is powerful enough to stop the rotation of the earth and revert it? Only one object can cause this: our sun. You know from my book, The OrionProphecy that the magnetic field of the sun undergoes a drastic change every 11,500 to 12,000 years. Once a crucial point has been reached, it reverses instantaneously. Chaotic outbursts accompany this phenomenon and an immense cloud of plasma is catapulted into space. Then a shock wave of particles reaches our planet and the polar reversal of our earth commences. With unknown power this solar lightning strikes our planet and causes a gigantic short circuit. That is the catastrophic truth behind a polar reversal of the earth. But how can we scientifically describe this fact? What is the precise physical cause that produces this polar reversal? In an equivalent scenario the field of the earth can reverse in just the same way. Astronomers know that the particles of a solar storm can compress the earth’s magnetic field and temporarily speed up the power of the earth’s field. This “ring current” generates an intense magnetic field that is opposite to the earth’s magnetic field. In order to overpower the earth’s magnetic field you need a solar flame a hundred times more forceful than the biggest one we have ever seen. At the reversal of the magnetic field of the sun this degree will certainly be reached. From here on, my point of view deviates from that expressed by Paul La Violette. Not only will the poles reverse, but also the earth will begin to rotate in the opposite direction! This can only occur when the “ring current” pushes the inner core of the earth in the opposite direction. Everybody knows that when you change the poles of an electric motor, it will start turning the other way. The same holds for the interior of the earth. When an external short circuit takes place, the core cannot do otherwise but start turning in the opposite direction! This catastrophe will not only result in the massive destruction of life on earth, but also its continued existence, however incomprehensible this may sound. Let me explain this. The magnetic field of the earth is not an accident of natural science. Its primary task is to protect us against cosmic and solar radiation. Without this field, life is practically impossible and in a short time, life on our planet would be extinguished. An all-burning, deadly radioactive radiation would torment the earth’s surface. So here we are talking about an incompatible duality: despite the fact that a huge amount of people, animals and plants will die, life will continue to exist, because the exhausted battery of the earth will be reloaded by the enormous solar storm. During thousands of years the magnetic field of the earth can therefore remain stable, protecting the flora and fauna against the damaging radiation. While doing this job, the inner battery of the earth will run out again and another cycle of destruction followed by creation and mutation will start anew. Is This A Real Dragon? Caesar – Dark Comet in 2012? Dragons – Were Dragons Real? Nazca Lines – Who created them? Nazca Lines – What do they mean? Nazca Lines – Belt of Orion? Pole Shifts – How could they Shift? Pyramids as Cosmic Ray Shelters? Culprit – Maybe Eta Carinae? 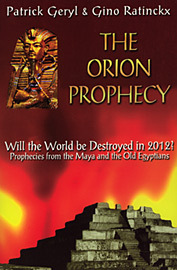 Copyright © 2000-2012 Robert Bast >>> Survive 2012: Ancient Mayan Doomsday, Pole Shifts and Evolution. Please ask before copying any content. This site uses the most excellent Joomla! , released under the GNU/GPL License.